Our company is one of the leading Exporters and Suppliers of Two Color Offset Printing Machines in the market. 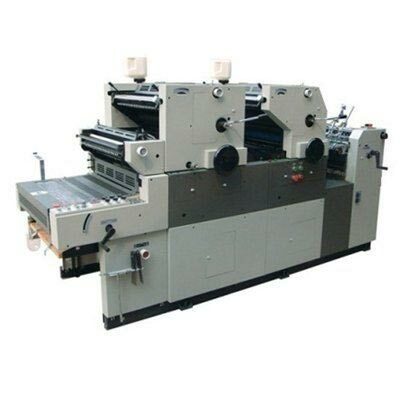 An ISO: 9001 Certified Company, we have got a huge reputation in the market for supplying high quality Two Color Offset Printing Machines with On-Line Numbering and Perforation. Besides this, our company is also interested in entertaining enquiries from a number of countries such as Sri Lanka, Bangladesh, China, Taiwan, Mauritius, Malaysia, Syria, Philippines, Uganda, Kuwait, Abu Dhabi, Jeddah, Dammam, Algeria, Kenya, Liberia, Bhutan, and Nepal. We manufacture these impeccable Two Color Offset Printing Machines with high grade raw material to ensure features like tensile strength, and resistivity in adverse conditions. The machine comes with 6 ink rollers and 2 ink form rollers which ensure good inking impact.